This bottle is one of a group of Imperial wares produced at Guangzhou during the Qianlong period. They all have very similar bands of decoration around the neck, shoulders and footrim, usually in iron-red enamel, although the main designs are varied. The group can be further divided into two types - those with iron-red Qianlong marks (typical of Imperial wares produced at centers outside the capital), and others with a jingzhi (respectfully made) mark. This bottle falls into the first category, which tends to vary more in shape. It includes one of a rare double-gourd form illustrated in Zhongguo Biyanhu Zhenshang, no. 378; one of compressed ovoid shape in the British Museum, London; one of similar shape to the present example in the Baur Collection, Geneva, illustrated by B. Stevens in The Collector's Book of Chinese Snuff Bottles, no. 985; one in the Reitberg Museum illustrated by R. Hall, Chinese Snuff Bottles. Masterpieces from the Reitberg Museum, Zurich, pp. 22-3, no. 5; and one of compressed spherical shape, B. Stevens, op. cit., no. 986, from the Edward Choate O'Dell Collection (also illustrated by J. Ford, Chinese Snuff Bottles. The Edward Choate O'Dell Collection, p. 50, no. 92). Bottles from the second category (bearing jingzhi marks) include one illustrated by R. Kleiner, Chinese Snuff Bottles The White Wings Collection, pp. 10-1, no. 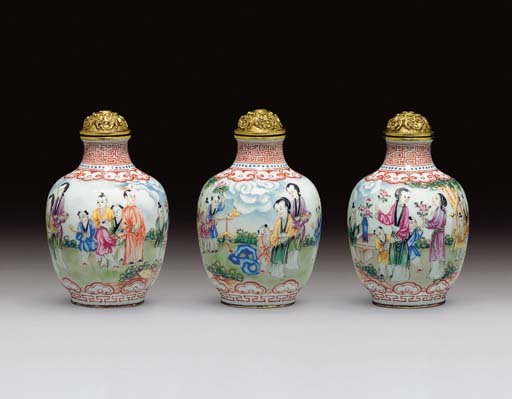 5, and one illustrated in the exhibition catalogue, Robert Hall, Chinese Snuff Bottles, 12-18 October 1987, p. 140, no. 70, while a pair of double-gourd-shaped examples are in Beijing, Masterpieces of Snuff Bottles in the Palace Museum, p. 60, no. 26. These bottles have all been painted following Palace style, particularly noticeable in the use of stippled areas where a series of minute dots provides graduation in the colors, and may have been designed by Court artists.